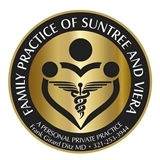 Family Practice of Suntree and Viera (Melbourne) - Book Appointment Online! Very professional and very responsive for health issues. Lives up to his promise to treat us as family. Unfortunately, due to extensive computer entries visit is lengthy.